A One Tier at a Time feature that looked at one of our smallest plans in the Employees’ Retirement System (ERS): Tier 1. An update for eligible NYSLRS retirees about the cost-of-living adjustment they’d receive in September 2015. How NYSLRS plans ahead to maintain the funds it needs to pay current and future benefits. How Comptroller Thomas P. DiNapoli defends NYSLRS against the abuse of public funds. Tier 1 may be the smallest tier in the Police and Fire Retirement System (PFRS), but it was the third most popular One Tier at a Time post to share. Each summer, we mail out approximately 700,000 Member Annual Statements filled with personalized benefit information you need to know. 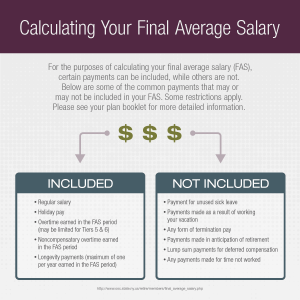 A NYSLRS Basics feature that looks at what your final average salary is and the part it plays in your pension calculation. Choosing how we’ll pay your retirement benefit is a big decision. Which payment option best meets your needs? Comptroller DiNapoli spoke to a retiree group about how the pension money paid to retirees flows directly back into our communities, stimulating and growing our local economies. Our most shared blog post is also our first One Tier at a Time post, featuring Tiers 3 & 4 in ERS. Thanks for sharing, and Happy New Year! Content last revised December 30, 2015. This entry was posted in General News, Members, Retirees and tagged 2015, ERS, Information is the Key, know your benefits, members, Most popular posts, most shared, New Members, New York State & Local Retirement System, NYSLRS, NYSLRS Members, NYSLRS Retirees, PFRS, ready-to-retire members, Retirees, Top 10, Top 10 Blog Posts on December 30, 2015 by NYSLRS. What are some of the changes you can expect in retirement? Sleeping in past 8 a.m.? Shopping during regular business hours? Retirement can bring many changes, but one you should be aware of is how your spending could change. According to an Employee Benefit Research Institute (EBRI) study, average spending goes down in retirement, but not for everyone. Some households’ expenses stayed the same while others increased. In the first two years of retirement, almost 46 percent of households spent more than what they had spent just before retirement. EBRI offered a suggestion for this trend – people may want to splurge on hobbies or vacations during the first few years of retirement. Keep in mind, the EBRI study is meant to understand trends in retiree spending, but it brings up a good question. Have you thought about how you’ll spend money in retirement? As you get closer to retirement, you may be saving and investing more to meet your financial goals. Making the switch from saving to spending in retirement can be easy if you plan ahead. By looking at how you spend your money now, you can get an idea of how to spend your money in retirement. When you set a post-retirement budget, look at what your expenses currently are. Don’t forget to include periodic expenses, like car insurance payments or property/school taxes. Track how you spend your money over a month or two. Then, consider your current monthly income and your post-retirement income. Your current monthly income should cover your current expenses, so estimate what your post-retirement income will be. If your post-retirement income is less than your current income, you might want to adjust your expenses or even your retirement plans. 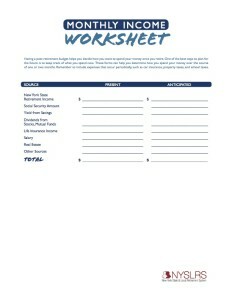 These worksheets can help you prepare a budget and list out your post-retirement income sources. Print them out and start planning ahead for post-retirement spending. Content last revised December 23, 2015. This entry was posted in General News, Members, Retirees and tagged budget, Budgeting, budgeting worksheet, EBRI, Employee Benefit Research Institute, ERS, Information is the Key, members, monthly budget, monthly expenses, monthly expenses worksheet, monthly spending, New York State & Local Retirement System, NYSLRS, NYSLRS Retirees, personal savings, PFRS, planning for retirement, Post-retirement, Preparing to Retire, retirement planning, retirement security, spending, worksheet on December 23, 2015 by NYSLRS. If you’re a Tier 6 member, meaning you joined NYSLRS on or after April 1, 2012, it’s important to start learning about your benefits. 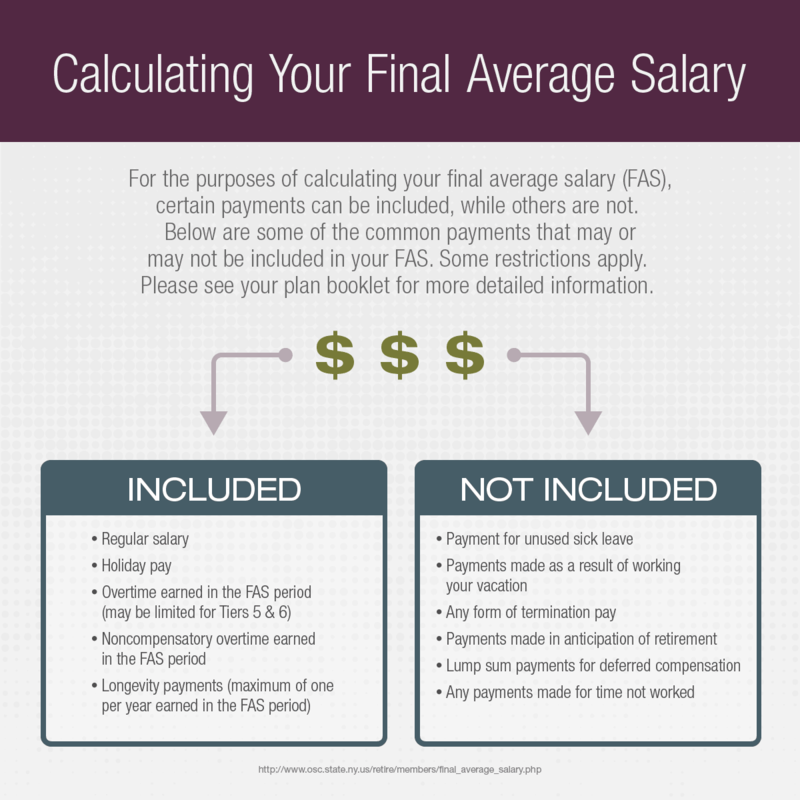 Even though retirement seems far off, it’s never too early to start thinking ahead. You can start planning your path to retirement by finding out what milestones you’ll reach on the way. Your Tier 6 member milestones are markers for when you earn a certain amount of service credit. You can reach some milestones within your first few months of membership. You reach others once you’ve earned 10 or more years of service credit. Once you reach 10 years of service credit, you hit another milestone: you become vested. This means that you will be eligible for a retirement benefit even if you leave public employment before age 55, although the benefit is reduced if it’s collected before age 63. Tier 6 members in the Employees’ Retirement System (ERS) are eligible to receive the full vested benefit at age 55. 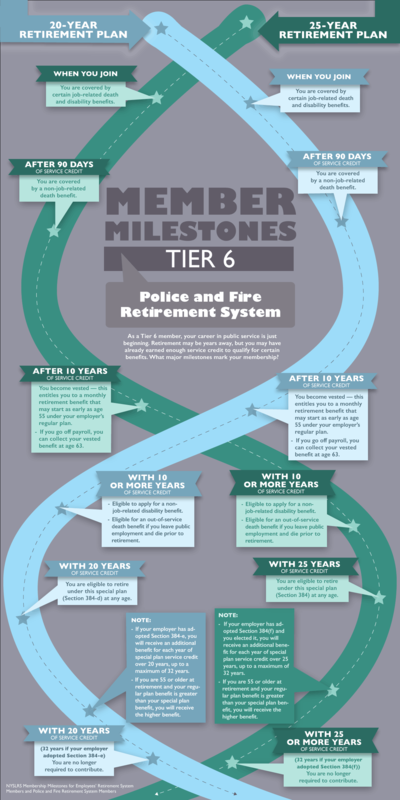 Tier 6 members in the Police and Fire Retirement System (PFRS) are eligible at age 63. Later on, the other milestones you’ll reach will focus more on retirement. For Tier 6 members in regular plans, the biggest milestone will be when you reach 20 years of service credit. This is when you’ll have enough service credit to retire with a full benefit. As noted above, if you retire before age 63, the benefit is reduced (you must be at least 55 to apply for the vested benefit). For Tier 6 correction officers, you’ll reach this milestone when you reach 25 years of service credit. Check out some of the other milestones for ERS Tier 6 members using the graphic below, or visit our website for a more detailed listing of ERS member milestones. 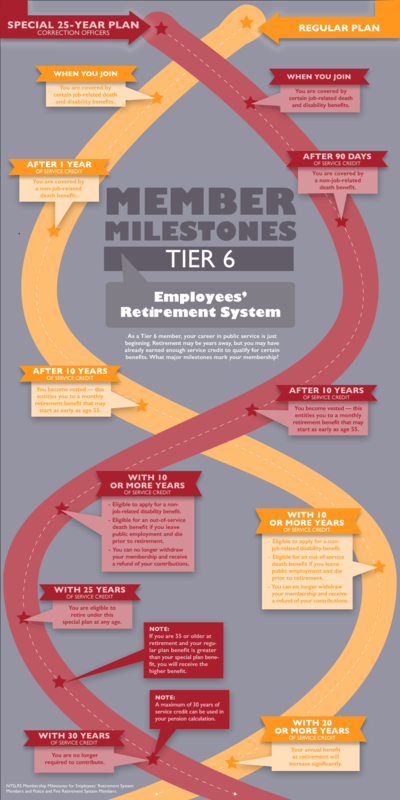 Some of the milestones for PFRS Tier 6 members are similar to ERS milestones, but some milestones vary based on what retirement plan you have. Check out the graphic below, or visit our website for a more detailed listing of PFRS member milestones. If you have any questions about Tier 6 membership milestones or the milestones for other tiers, please email us. Content last revised December 9, 2015. This entry was posted in General News, Members and tagged benefits, defined benefit plan, ERS, Information is the Key, member milestones, members, New Members, New York State & Local Retirement System, NYSLRS, PFRS, Preparing to Retire, retirement plan, retirement planning, Service credit, Tier 6, Tier 6 Benefits, Vested, vesting on December 9, 2015 by NYSLRS. 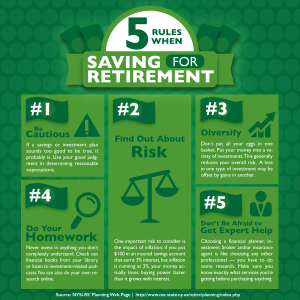 When you’re preparing for retirement, you want to avoid costly mistakes. And while hiring an attorney or accountant may help, think about hiring a financial planner too. A financial planner can help you develop a practical plan to help you meet your retirement goals. What Do Financial Planners Do? Financial planners do not manage your money. According to the Financial Planning Association of Massachusetts, financial planners assess your current financial health. They examine your assets, liabilities, income, and more. They help you develop a realistic plan to meet your goals by looking at your financial weaknesses and strengths. With their help, you can put your plan into action and keep track of its progress. If your goals change over time, they can also help you adjust your plan. Certified financial planners must also abide by a code of ethics. Check credentials, educational background and experience. Find out if he or she is a member of the Certified Financial Planner Board of Standards. Get referrals from people you trust – ask friends, relatives and business associates. Do they research the financial products they recommend? Do they offer a free consultation? Are they paid by fee, commission, or salary? Content last revised December 2, 2015. This entry was posted in General News, Members and tagged ERS, Financial planner, Financial Planning, Information is the Key, members, NYSLRS, personal savings, Personal Savings Plan, PFRS, Preparing for retirement, Preparing to Retire, retirement, retirement age, retirement plan, Retirement planners, retirement planning, retirement security, Saving for Retirement on December 2, 2015 by NYSLRS.